In the course of the game beautiful buildings will be created and at the end a medieval city will stand in the middle of the table - complete with city walls, fortified towers, city gates, houses and a town hall. 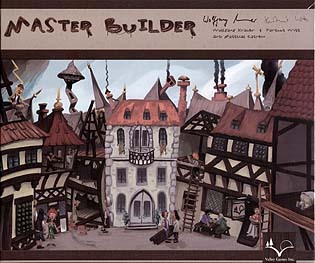 Master Builder was quietly released by Valley Games but when I saw it was a Kramer game I had to buy it. The game is about city building using workers with different abilities, which you have to manage, to build buildings in 3D models - a novel idea in itself. You secure building contracts for your workers by bidding for them and when you complete a building you get cash which you can use to hire and fire more workers to uild more buildings - you get the idea. The game lasts for six rounds and the most money wins. There are a lot of pieces in the box and you need to take care whn punching out the pieces from the frames. However, each piece has a number on the back of it and the insert has numbered slots - just match them up to store the game away - I'd recommend storing the game flat though.